Almost immediately after the 1956 Holy Week changes, a chain of reforms was paraded out in quick succession, each one containing a revolutionary breach with tradition, and each decreasing the role of the celebrant while greatly promoting the “active participation” of the laity. 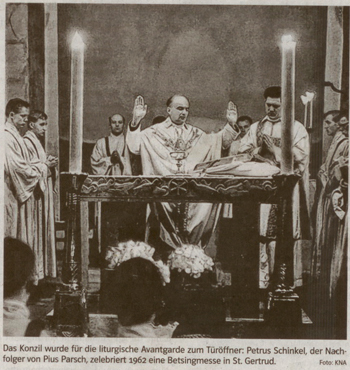 The Instruction was touted as “the last act of the great Pope of the Liturgy on behalf of the Liturgical Movement.” (1) This description by one of the key proponents of 20th century liturgical reform was not just an example of empty rodomontade or a propaganda exercise. Pius XII’s document was, in fact, foundational for the creation of the Novus Ordo in ways that will be analyzed below. •	§ 25a: Sing the liturgical responses to the priest. •	§ 25b: Sing the parts of the Ordinary: Kyrie, Gloria, Credo, Sanctus-Benedictus, Agnus Dei. •	§ 25c: Sing some of the Propers of the Mass. This was an astoundingly radical innovation. There is no historical precedent for congregational singing of the Propers. These had been sung by specially trained choirs since at least the 7th century. •	§ 13b, c: Sing liturgical texts in the vernacular with special permission. •	§ 14a: Add some popular vernacular hymns with permission from the local Bishop. This was only the tip of a very large iceberg. 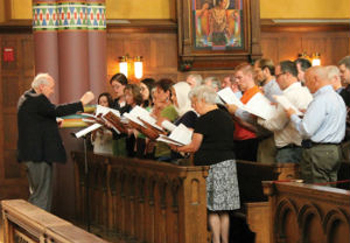 For, as Bugnini revealed, the original intention was that “the principle of songs in the vernacular is to be extended to the entire Church in the reformed Roman Missal. (4) Already in 1958, permission was available for the faithful to sing their favorite number in the vernacular during solemn Mass. •	§ 27c: Recite the three-fold Domine, non sum dignus together with the priest before receiving Communion. •	§ 96: A Commentator (who may be a layman) could exercise a liturgical ministry by standing in front of the congregation and audibly explaining the different parts of the Mass. •	§ 100: Women and girls were permitted to join “mixed” choirs or form their own all-female choir to sing the liturgy. •	§ 31c: Say aloud with the priest all the parts of the Ordinary as at Sung Mass noted above. Nothing could be more calculated to destroy the atmosphere of the “Quiet Mass” than an incessant stream of audible responses from the congregation. •	§ 31d: Recite together with the priest the parts of the Propers: Introit, Gradual, Offertory, Communion. 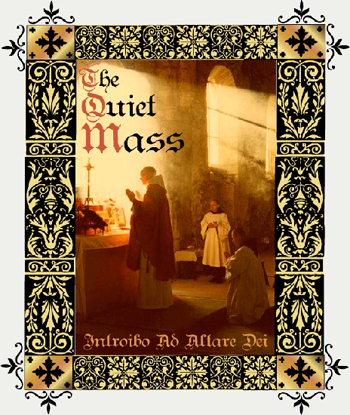 •	§ 32: Recite the Pater Noster, including the Amen, in unison with the priest. This innovation was first introduced in the 1951 Easter Vigil and Good Friday reforms. The communal recitation of this prayer is found in Protestant traditions. In the traditional Catholic liturgy, it has always been a sacerdotal prayer and was neither said by the server nor sung by the choir. •	§ 31b: Recite the triple Domine non sum dignus together with the priest before receiving Communion. This particular point of the Mass, traditionally reserved for quiet reflection on one’s own unworthiness, was now “exteriorized” for all to hear. •	§ 14b: Sing popular hymns or say aloud some prayers in the vernacular. 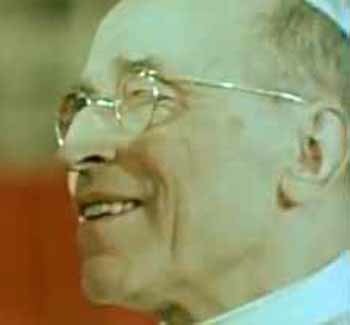 Thus, Pius XII rewarded the disobedience of innovators who had, against the rubrics, been promoting vernacular hymns and prayers in the Mass. For this purpose, Fr. 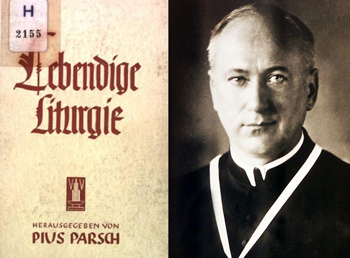 Pius Parsch had devised the Betsingmesse (“Pray-Sing-Mass”) in the 1920s, which rapidly spread throughout the German-speaking lands and became the model for liturgical reformers in other countries. An official approval was given in § 14b of the so-called “4-hymn sandwich,” interspersed among all the talking parts for the laity, which became ingrained in most parishes and still survives in the Novus Ordo. •	§ 14c: A Lector could read the Epistle and Gospel to the faithful in the vernacular while the priest was reading them in Latin. The point of the exercise was for the Lector (who could be a layman) to effectively “voice-over” the priest. This practice had already been popularized by Fr. Parsch’s Betsingmesse. A future step would be to have vernacular-only readings, for which the liturgical reformers had long been clamoring. Unlike the Holy Week reforms, these reforms were only permissive rather than prescriptive, which explains why users of the 1962 Missal do not always follow them. Yet their effect was unfavorable to Tradition. The 1958 Instruction was approved by Pius XII “in forma specifica,” indicating his personal involvement in the preparation of these revolutionary reforms. Henceforth, traditionally-minded priests were placed on the back foot, as it were, with the onus on them to provide a rationale for their continued use of the Church’s traditions. 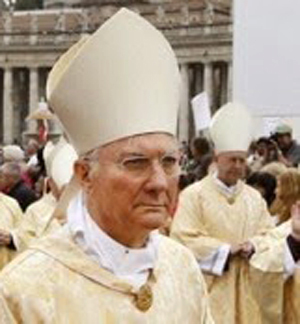 Archbishop Piero Marini, who had worked under Bugnini in the secretariat of the Consilium (the Commission that designed the Novus Ordo), described this Instruction as “a victory for the Consilium’s approach to liturgical reform.” (6) It is not difficult to see why. In this reform, which could be aptly termed Bugnini’s “Operation Switcheroo,” the celebrant becomes the “mute spectator” while the people become directly responsible for proclaiming parts of the Mass that had traditionally been invested in the celebrant. However, as a sort of consolation prize, Inter Oecumenici condescendingly granted that “The celebrant may sing or recite the parts of the Ordinary together with the congregation or choir” (§ 48b), i.e. as if he were an ordinary member of the assembly. J.B. O'Connell, Sacred Music and Liturgy, London, Burns and Oates, 1959, p 13. Annibale Bugnini, The Reform of the Liturgy, p. 903. Pius X, Tra le Sollecitudini, 1903, § 13. Piero Marini, A Challenging Reform: Realizing the Vision of the Liturgical Renewal, 1963-1975, Liturgical Press, 2007, p. 81.